TubeNet • View topic - See Wessex at TMEA! 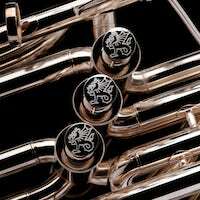 If you are coming to TMEA, visit Wessex Tubas booth 161, try the horns and find out for yourself how great they play - and how much the quality has improved. It is our biggest booth and display ever (even bigger than DC), so much of interest. Introduce yourself to Chuck Nickles, Eric Hunter, Carl Kleinsteuber, or me Jonathan Hodgetts. Always great to meet another Tubeneter! Re: See Wessex at TMEA! Mark Finley wrote: See you tomorrow afternoon! Was Viverna the name of the 4/4 tuba?? Or the fetching woman that was working the booth with him in DC?? Three Valves wrote: Was Viverna the name of the 4/4 tuba?? Super, I could use a fetching woman during grouse season. Kudos to Wessex R&D for really branching out.